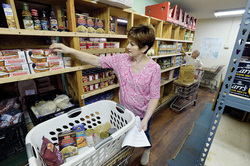 Wednesdays 4 to 6 p.m.
Food pantry with USDA commodities and produce. Based on need. Clients must bring identification and address. Apply in person. Want to Donate to the Pantry? Call the church office at (936) 564-2471 between 8 a.m. and 5 p.m. Monday through Thursday and 8 a.m. to 3:30 p.m. on Friday. The office will be closed daily from noon to 1 p.m. for lunch. You can also email at northstreetchurch@gmail.com.